Dailycer UK, which produces own brand cereals and cereal bars for the UK’s leading supermarkets at Deeside Industrial Park, will also create 15 jobs. A £4.2 million investment in a new hi-tech production line is set to help breakfast cereal manufacturer Dailycer UK secure around 140 jobs and create 15 more. Dailycer UK, which produces own brand cereals and cereal bars for the UK’s leading supermarkets at Deeside Industrial Park, is to double its turnover to over £54m in three years. The investment and expansion – which was supported by £480,000 from the Welsh Government’s Economic Growth Fund – safeguarded the entire workforce and has already created fifteen new jobs, bringing staff numbers up to 154. The investment involved the creation of a mezzanine floor and external extension to accommodate the new technically advanced cereal bar production line. 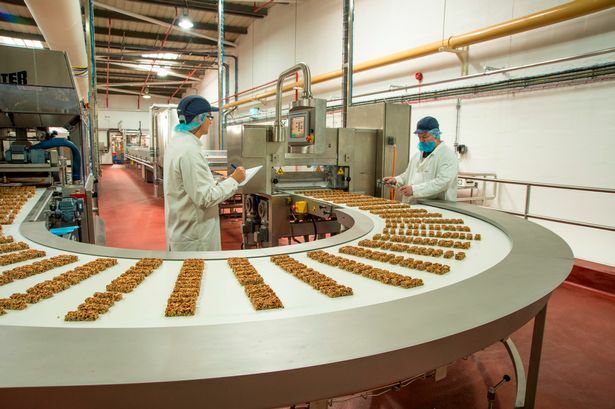 It will boost the factory’s production capacity to 5200 tons of cereal bars a year and discussions around new products are already under way with many existing and potential new customers in the UK and Europe. The new line, which is now ready for commercial production, will be officially launched at an Open Day during Flintshire Business Week ( 13-16 October). Economy Minister Edwina Hart, who visited the company last year, said: “Dailycer is an important employer in the region and I am delighted Welsh Government support is helping to create and safeguard jobs. Managing director Pete Robertson said the new state-of-the-art equipment introduces new technology to the site enabling the business to compete effectively in an increasingly competitive market. The equipment means production is leaner, more energy efficient and minimises waste with a number of sophisticated features which add value through the ability to create an extensive range of new recipes, coatings and innovative shaped bars. Mr Robertson said: “A wider and highly innovative product range makes the business far more competitive for the future and opens up a range of new opportunities to serve different market segments and explore export markets. Dailycer’s fortunes have been turned around since its acquisition by an Indian entrepreneur in 2013.